Impressive work, thanks for showing us, are you aiming for production? Had a look at your website, some interesting there. Always happy to help out a fellow modeller. John's 'Power Egg' has an outside diameter of 35mm and a weight and thrust equivalent to the old Jetex 100. 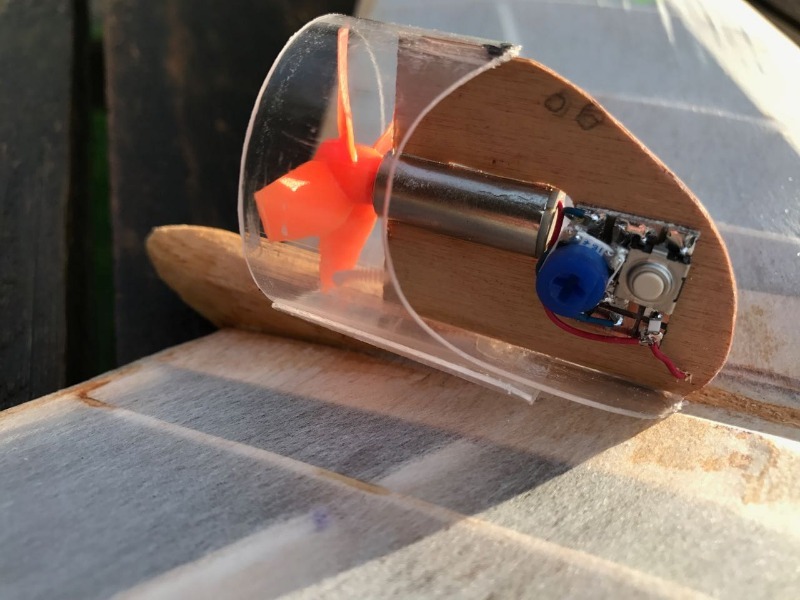 John wanted his homemade unit to be both efficient and cheap, as (for most of us!) cost is a consideration, and it had to be low enough to make free flight loss acceptable. This was quite a challenge, and the motor and the fan, in particular, were items where John needed to be creative in his sourcing. All Jetex motors have a thrust somewhere between the unloaded weight and the loaded weight of motor (except for the 50R ‘rocket’ motor which traded duration against a higher thrust). 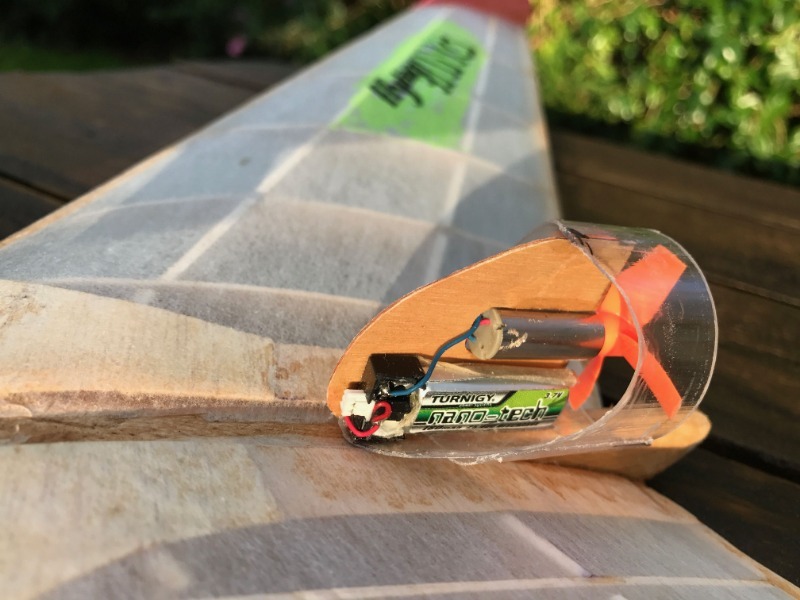 The loaded weight of a Jetex 100 motor was 28g, so a thrust of 270- 300mN for the Power Egg was aimed for. The motor has to run at very high RPM for inlet/efflux velocities upwards of 20 metres/sec. A 2 cm pitch fan needs to run at 60,000+RPM to provide this, achievable if the fan is well balanced, but 60,000 rpm is not compatible with a long motor life! I.C. coreless brushed motors handling 6-10 watts in a 8.5mm diameter have been used in quadcopters for some years now, typically as spares for the Hubsan 107C. Though this is somewhat short of the 20 watts required, at under a couple of pounds each, they are well worth a try. These motors have no thrust bearing, so, to give the motor an easier time, recent developments have focussed on tractor (as opposed to pusher) installations. 35mm diameter four bladed fans are available as spares for the 'Warlark 80' Quadcopter. These can be cut down to the 32.5mm diameter needed to suit the 35mm outer diameter 0.5mm thick clear plastic packaging tube used as the mounting shell. The important factor here is the discharge current not the capacity; the power source needs to conveniently provide several 15 second runs without recharging. Surplus 'Parkzone' Li-Po cells of 130-200mAh are available at for one to two pounds each. Perhaps uniquely in model circles, a timed run of even 30 seconds will only exhaust such a cell 10% or so. This means that 10-20 flights will be possible before recharging is necessary. The 1.25mm R/C connector is retained for charging and provide power. For; for free flight, direct connection to the timer is used. This has no significant current leakage, and so no switch is required. Removing superfluous leads, connectors and switches saves weight, and, happily, power loss. The mounting clip was an essential part of the Jetex motor, insulating the model structure from high temperatures and allowing for safe motor breakaway [!] in heavy landings. With the necessary screws and hardwood motor bearer, the clip constituted about 10% of the total weight. The Power Egg's clip is a 90-degree piece of the same plastic tube secured with reusable sticky pads. As an EDF has a constant mass, moving it fore and aft in the clip enables centre of gravity adjustments. This is really good stuff, and I look forward to further developments from John. Even I might give it a go! One point: John writes, "I hope someone can come up with a better name than 'Power Egg'! At 60,000 rpm this must be a real whizzer or should that be whiner? Very neat and clever though, quite fascinating, we all love a low cost unit with easily replaced parts should they wear out quickly. 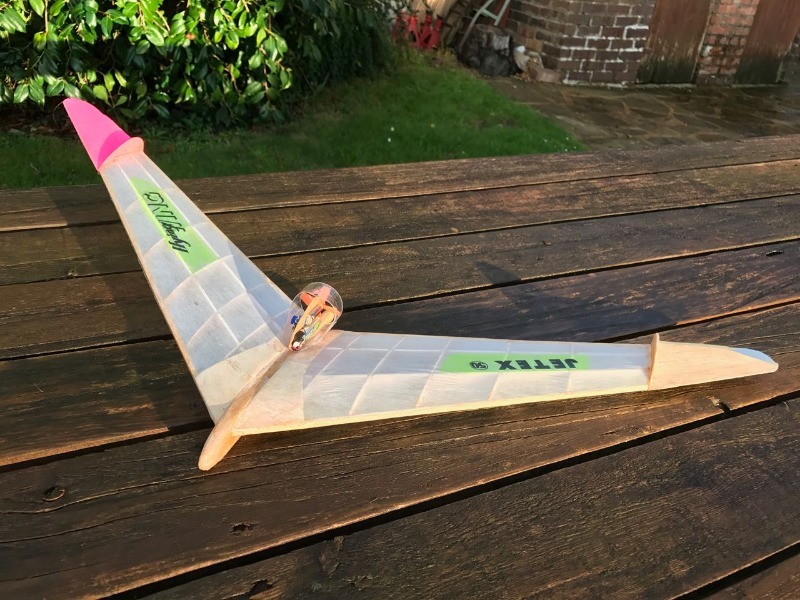 The clear shroud in this instance is perfect as it takes away the visual bulk normally associated with an EDF unit, ideal for the Jetex Flying Wing. Is the fan mounted on backwards on purpose or is that an illusion? As for the name the Emmett Fan Unit sounds better IMO. 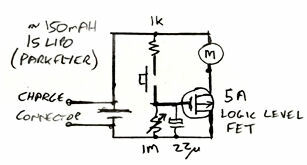 Sadly the circuit for the timer is lost on me so I would need to obtain that somehow. Roger adds: How about the 'Emmet Egg'?